Crown Tournament is coming up this weekend. Good luck to all combatants who seek the Crown! But before you enter the list, you should know what you just might be getting yourself into. 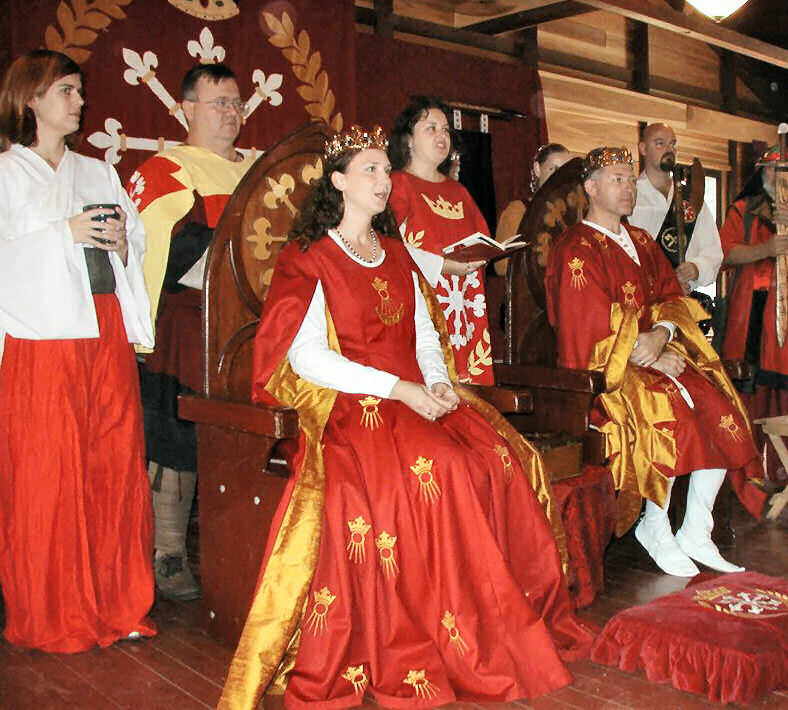 Mistress Arianna of Wynthrope sought comments from past and current royalty on what it takes to be King and Queen of Æthelmearc. Here are their replies. 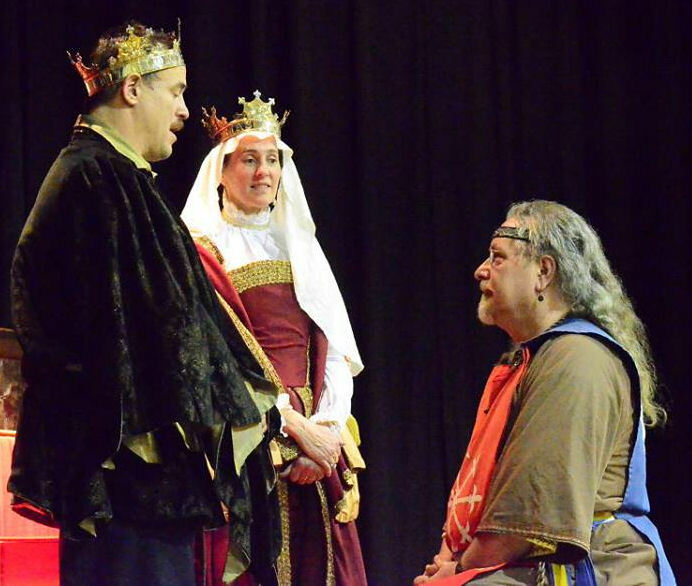 King Isenwulf crowns Andreas as Prince. Photo by Baron Friderich Schwartzwalder. So what is really needed for a good reign? Being on the throne takes time, and lots of it. In addition to the time spent at and traveling to and from events, there are countless emails to read and write, phone calls to make, meetings to attend with officers, orders, and staff, and a LOT of planning. Being King and Queen is not a weekend hobby; it requires attention on weekdays as well. Their Majesties, Timothy and Gabrielle. Photo courtesy of Her Majesty. Royal couples can spend a lot of money being on the throne. Or they can spend a really huge amount of money. Yes, the Prince, Princess, King, and Queen receive stipends, and people often donate to the royal travel fund, but you should not expect those amounts to cover the entire cost. Maynard and Liadain. Photo by Duchess Anna Blackleaf. If you’ve read past Gazette articles on being a Royal Retainer and serving on the Queen’s Guard, you know that Royalty need a staff. Those people don’t just materialize automatically. Sure, some of your friends may volunteer to help out during your reign, but you need to make sure you have people with organizational skills, and plenty of them, from a wide array of groups around the kingdom. You’ll also need some people willing to do the unglamorous “grunt” work of setting up and tearing down thrones and pavilions, gathering feast gear, babysitting kids, etc., because you’ll be too busy to do it yourself. Royal retainers and guards. Photo by Mistress Rowena ni Dhonnchaidh. Sovereigns are expected to dress well. Remember that you do not just represent yourself – once you are wearing a coronet or crown, you are Æthelmearc, both to your populace and to other Crowns. No more wearing ratty T-tunics or running around in just your chemise on a hot day; you need to look good at all times in public. Most gentles do not have the sumptuous wardrobes of royalty, so be ready for a lot of sewing. One of the cool things about being on the throne is that you get lots of stuff: thrones, crowns, pillows, feast gear, banners, even tents. One of the challenging things about being on the throne is that you have to store and transport all that stuff. Kings and Queens must work with a wide array of people, not all of whom will agree with everything the Monarchs want to do. Many will have concerns they want you to address, ideas they’d like to see implemented, or even arguments they want you to settle. Diplomacy is an important part of being on the throne. Being on the throne can also strain your personal life. 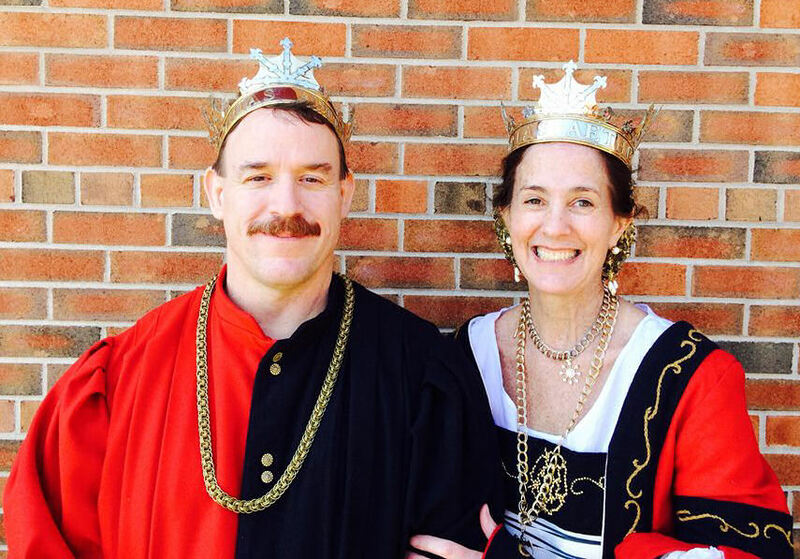 Some Monarchs have found that it was hard on their friendships and even their marriages. Andreas and Kallista. Photo by Master Augusto Giuseppe da San Donato. 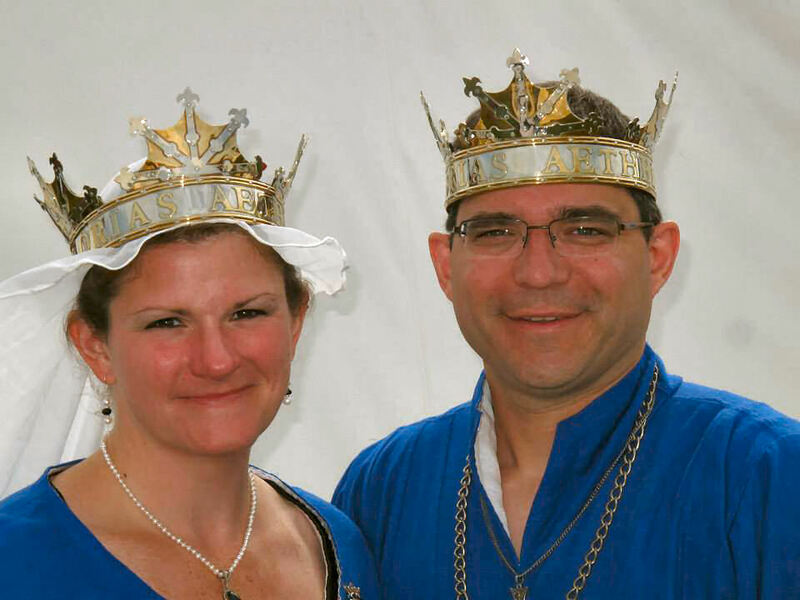 Christopher and Morgen at their Coronation. Photo by Mistress Ts’vee’a bas Tseepora Levi. Of course, one of the chief responsibilities of royalty is to attend events all over the Kingdom. 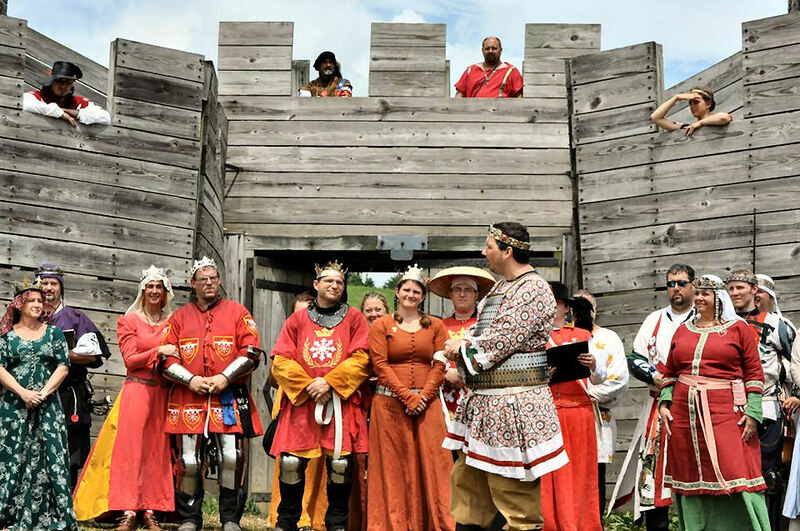 While Æthelmearc is not as large as some Kingdoms, if you are from one of the far ends of the realm, you may end up driving as much as 10-12 hours to get to an event at the other end of Æthelmearc. Most weekends, you will be driving long distances, in good and bad weather. And remember all that regalia? Most of it needs to go with you on every trip. Adding children into the mix of being Sovereigns presents its own challenges. 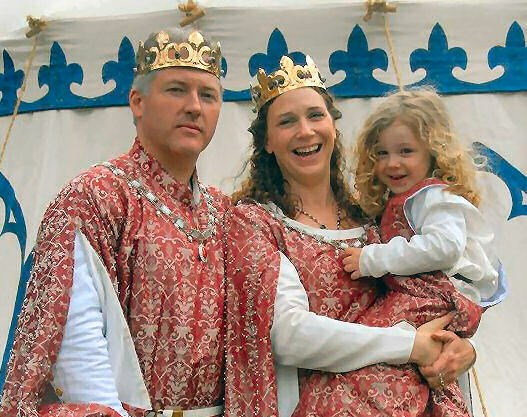 Several of our past Crowns have had children, sometimes very small ones, while ruling. Christopher and Morgen with their daughter. Photo by Mistress Ts’vee’a bas Tseepora Levi. Winter and summer reigns each have their unique challenges. 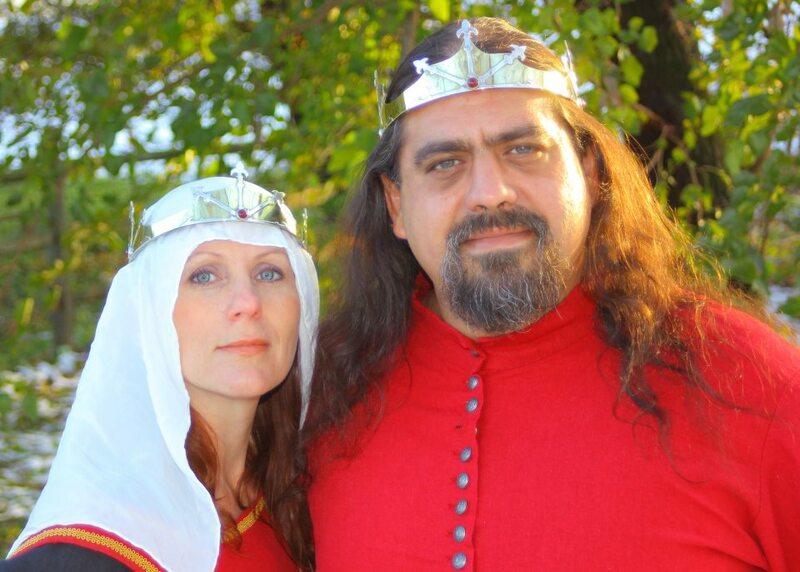 Æthelmearc Royalty at Pennsic 42 Opening Ceremonies. Photo by Lady Marissa von Atzinger. 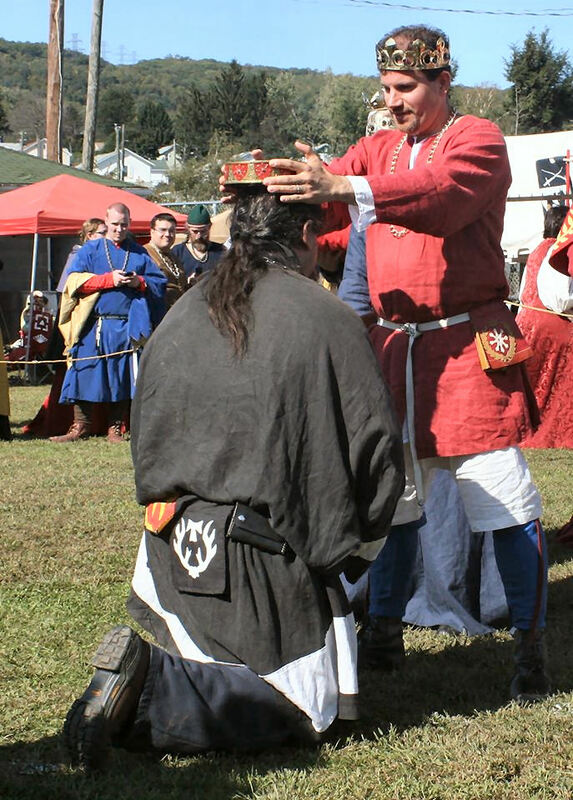 Some crown combatants may think the reward for winning Crown is that they get to wear fancy jewelry, have a lot of attention paid to them, and receive gifts from the populace, as well as advance in rank when the reign is over. The royals we spoke to found different aspects of their reigns to be the most rewarding. Timothy and Gabrielle with THLord Brada Æthelward. Photo by Master Alaxandair Ó Conchobhair.